“Cloud” was the buzz word of the IT industry at the start of this decade along with mobile devices - the mini super computers in our palms. While cloud transformation and mobility reaching its pinnacle now (if not already reached), the last few years have been about Digital adoption, AI and ML. Thanks to Google and Sundar Pichai’s keynote addresses for making even a novice like me get an idea of AI and ML. Any consultant working in an on-premise ERP would know that, the growth and opportunities provided in these newer IT trends has had a more pronounced impact in ERP space. What is meant by Cloud ERP or ERP on Cloud? Cloud ERP systems are ERP systems that are hosted in the cloud (public\private) instead of installing the ERP software in servers hosted in-house (on-premise). Cloud ERP systems in general adapt pay per use model - SaaS. Okay, so what next? Should we jump start the movement to Cloud ERP? Though the trend is to have IT solutions on Cloud, we cannot simply move on-premise ERP to cloud or buy a cloud ERP product. Let's explore Cloud vs On-Premise ERP further. There are many web resources already available on differences between a Cloud ERP vs On-Premise ERP. Among several such information, I liked Oracle Netsuite's article on HOW CLOUD ERP COMPARES TO ON-PREMISE ERP? 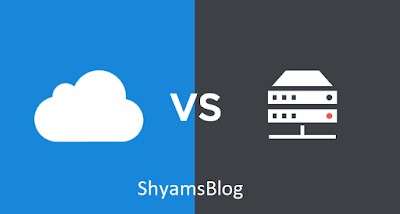 In this post, I share my views as a summary on cloud ERP system and how it differs from the on premise ERP system. You purchase an ERP product, buy the required hardware, host them in your data centers, buy and install the supporting platform including OS, middleware products and database and then install, configure and customize the ERP product. The onus of data backup, securing the data center and the servers hosting the ERP system lies with the implementing organization. To manage and maintain the on-premise systems, even the hardware maintenance would need specialized people, along with the need to have high knowledge workers to perform the administrative actions, development and maintenance support for the ERP system. On-Premise ERP systems are delivered with rich functionality that is based on standard policies, procedures and practices generally accepted at a high level by enterprises across the globe. However, the one size fits all approach may work for smaller firms where there are no unique processes. The good part and major USP of On-Premise ERP is, the product can be customized to the needs of the implementing organization. The product also allows adding new functionality in addition to the ones delivered by the On-Premise ERP provider. Implementing organization should also take responsibility for taking care of applying patches released for all related software and implementing regulatory changes like PPACA(Obamacare) in the US or GST implementation in India though the On-Premise ERP provider will deliver the necessary changes. Let alone understanding what issue is fixed in a patch, even to find out if you need to apply the patch requires skilled workers who know their trade. Similar to On-Premise ERP, Cloud ERPs are also delivered with rich functionality that is based on standard policies, procedures and practices generally accepted at a high level by enterprises across the globe. Cloud ERP systems are generally provided as Software-as-a-Service (SaaS) where you pay a fixed fee per employee for a specific period. Sounds as simple as paying for your telecom service provider!! There is even more. These products are provided by companies over their highly secure cloud space enabling continuous availability and a mobile friendly UI. Customer can only focus on using the product sans the overhead around hardware, platform, software, upgrades (to major extent) and regulatory changes. Imagine you buy a product, and you could roll it out to employees faster and allow them to simply use the product without any need for you to even think about the underlying hardware and software and other maintenance requirements. Sounds cool isn't it. Think of the additional cost saved by the removal of these overhead and the intangible benefits of not having to rely on individuals, teams and vendors. That's exactly what a Cloud ERP could do. However, it comes with major disadvantages of (i) no flexibility to change the product to suit your organization needs and (ii) no ability to add newer functionalities which the product does not provide. These two disadvantages are directly proportional to the benefits of a Cloud ERP. If at all the product would allow customized and custom functionality, then many of these benefits would no longer exist. In simple words, Organization processes need to tailored to the standard processes supported by the product. Cloud ERP or On-premise ERP - Which is Cost Effective? I know as you read, many of you might be pondering over the cost aspect. Depending on the number of users and years a customer uses the product, cost can work either in favor of On-Premise ERP or Cloud ERP; though cloud ERPs are generally considered as cost effective due to reduced initial cost. But the TCO may not always be in favour of Cloud ERPs. In my view, on-premise ERP might work out cheaper for larger corporations, considering the subscription charges for Cloud ERP does not reduce with increased no. of users contrary to various popular pay for usage model services. Which one is better - Cloud ERP or On-Premise ERP? Well, the answer to this question is contextual. Neither Cloud ERP nor On-Premise ERP may solve all the ERP challenges of your organization. Both line of products bring their own advantages and disadvantages. The advantages of a Cloud ERP are the disadvantages of an On-Premise ERP while the disadvantages of a Cloud ERP are the advantages of an On-Premise ERP. That's a Catch 22 Situation. Set aside the cost aspect and various other factors, selection can be influenced depending on whether your organization is willing to adapt to the ERP product or want to tailor the ERP product to facilitate the several unique processes of your organization. The former may work for mid sized organizations while the latter may be the need for larger global enterprises. Cloud ERP may look cost effective, but if you end up having multiple custom built applications or third party products integrating with the Cloud ERP (to support the missing functionalities), any cost advantage of a Cloud ERP might go for a toss. While the integration capabilities of a Cloud ERP is excellent, the other important factor to consider is why an organization is using ERP in first place? Is it to save dollars or to improve operational efficiency? If your organization's objective of ERP is to have reduced costs, TCO calculation will give an instant answer, if the objective is to improve operational efficiency and the cloud product does not support your operations, then On-Premise might be the answer. Choosing between a Cloud ERP and an On-Premise ERP is not a simple task and is influenced by several factors referenced above. In the end, the decision might also be based on who among your CTO, CIO and CFO has their say. Many organizations adopt a hybrid model focusing on popular Cloud ERP for self service and frequently used transactions and specific solutions for various other needs. If the unique functionalities you have in your on-premise ERP cannot be get ridden off and yet the benefits of having your ERP in cloud like availability and near zero hardware\platform maintenance matters to you, then consider moving your On-Premise ERP to Amazon or Azure cloud. If your On-Premise product is PeopleSoft, PeopleSoft can also be hosted on Oracle Cloud. However, these two solutions are not SaaS solutions. Some popular On-premise products include PeopleSoft, SAP and Oracle EBS while some of the leading cloud ERP products are Oracle Cloud, Workday and SAP among several others. In my next series of posts I will be writing on Oracle HCM Cloud modules with focus on self-learning along with basic tutorials and troubleshooting.